Bear Fever artist for both Body-Borneman Insurance’s “Box” bear and “Kenny,” Ken Ellis’s Legion Bear, Doug Davidheiser started in his art and sign painting business thanks to Bill Ellis painting cars @1970. Doug Davidheiser went “all out” for his friend Ralph Borneman by totally refashioning a Bear Fever walking bear. Doug took his saw to 3 legs and the head, added 4 gallons of putty, and created a unique bear for the project. “Box” sports Ralph’s high school number 14 and stands tall for now in front of the Body-Borneman Insurance office on Philadelphia Avenue in Boyertown. Arriving at Body-Borneman Insurance officewith my co-interviewer, Sam, I was feeling quite nervous and wasn’t looking forward to having reluctantly sophisticated conversations with professionals armed with briefcases and ties. 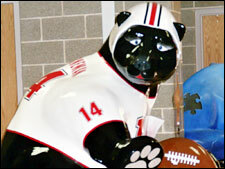 However, the initial words of Mr. Ralph Borneman, sponsor of the Body-Borneman football bear, put me more at ease. “Mr. Borneman is my grandfather,” he said. “But if you’re looking for Ralph, then, yes, that’s me.” It was at that point I knew that the twenty-minute interview awaiting me when I stepped into the conference room would be rather amusing. In his younger days (or from what he can remember of them), Ralph was a normal kid who did “normal kid things .” He liked playing many sports, but it was his interest in football that led him to attend Muhlenb erg College and play on their football team. Although injury prevented Ralph from coming back to the field as a player, he returned after graduation - this time on the sidelines as a coach . He remained an English teacher at Boyertown High School for a while, but eventually switched over to the corporate world. Today, Ralph, along with Mr. Howard E. Body, manages Body-Borneman Insurance in central Boyertown. Despite having left so many things in his past behind, he still remains friends with Doug Davidheiser, who used to be one of his players. Meeting Doug Davidheiser, known as “Peanut” to his oldest friends, taught me a thing or two. I never thought of sign painters as artists; I thought of them primarily as businessmen. Now I know better. Doug Davidheiser has been involved in the arts his whole life. As a child he shaped his creativity by painting toy cars; and as he grew older, he painted his friends’ cars. He was good, but never had the best equipment. In high school he only dabbled in art classes but was always impressed with Boyertown’s art department. He remembers Mr. Gerhart as one of his best art teachers and was inspired by the work of classmate Linda (Rohrbach) Austerberry. His fulltime hobbies in high school revolved around sports—particularly diving, swimming and gymnastics. In fact, his association with Mr. Ralph Borneman began during his years as an athlete at Boyertown High School. Mr. Borneman was his varsity football coach. They’ve been friends ever since. While no one was watching, he practiced dancing in front of the mirror while American Bandstand was on and impressed all the girls at junior high dances. At college his art interest was furthered because his roommate was an art major and Doug often completed his projects for him. Plus, he worked on a friend’s race car and that’s when he knew he had a gift for lettering. But his major in college led him to a 35-year career in teaching physical education at Reading Middle School which he enjoyed until the end. During his last years he felt the kids’ attitudes prohibited them from excelling which he found discouraging. While teaching, however, Doug kept his art skills alive by maintaining a small sign painting business specializing in signs for real estate. He tried to stay small at first but his business grew quickly through referrals. He became more and more skilled with each job and learned techniques like pinstriping, gold leafing, and silk screening. He holds the title of being the first in Boyertown to do work in vinyl. He gives credit to one of his friends who discovered this new technology while on vacation in Germany. He’s very happy in his business working by himself and enjoys the niche he’s created in the sign painting world in Boyertown. He takes some pride in his home—its history and in its purchase—and the barn he built to house his business. It’s huge! 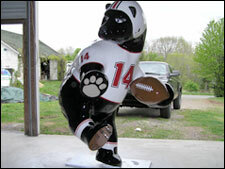 Doug’s bear is unique in the Bear Fever collection; it is the only one standing on two legs. 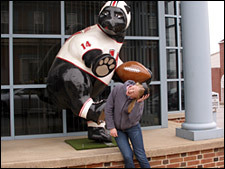 Doug was determined to make it the best bear; and it took 4 gallons of body putty, 415 rivets to hold the inner section together, and a lot of courage to cut 3 legs and the head completely off a $1400 Bear Fever walking bear to fashion the image of a football quarterback in a Heisman Trophy position. Doug had his bear “on the brain” everywhere he went. He found the perfect sized lug nuts at a truck stop that he used for the cleats. 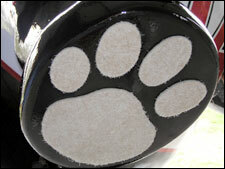 He found felt from Home Depot for the paws. One of the reasons Doug believes that his bear turned out so well is that Ralph supported his efforts totally and spared no expense; Doug was given a generous budget. Doug also completed Ken Ellis’s Bear Stadium Bear but is not happy with the results and insists “Kenny” will be totally refashioned into a catcher position for the spring of 2006. 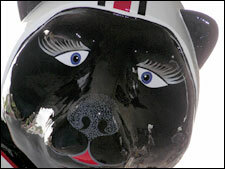 And once again the bear will need to be chopped apart to achieve the effect Doug has in mind.